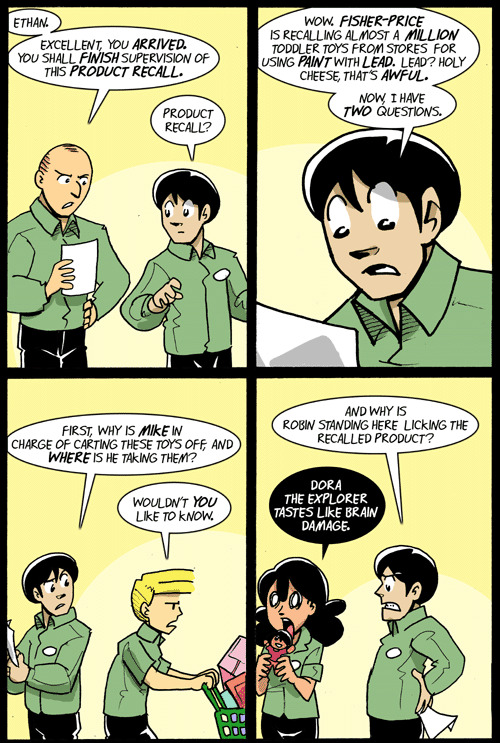 Leading Robin Astray | Comics I Don't Understand - This site is now being updated daily at http://www.comicsidontunderstand.com. Please change your bookmark if necessary, and notify any web site with a link to the old address. Why is she licking them?? I think the problem here is that Shortpacked is a fusion of Gag-a-Day and story. Robin, the girl licking the toys, has a history of bad choices, laughable antics, I think inexplicable super-speed, (or it may be that she has some alien DNA as a holdover from Willis’s previous dramatic strip “IT’s Walky”, which appeared to be an earlier attempt to leave behind the dramatic mire of his strip before that, “Roomies”. I think the joke here is rooted in a familiarity of the character, any time something is toxic, dangerous, or just ill-advised, Robin will jump on it. the blonme guy carting off the recalled toys, Mike, is a consummate jerk and A@@h@@@, and is probably planning some scheme to donate them to an orphange, children’s hospital, or something of that ilk. Willis tends to start with a “gag a day” lightness to a strip, but then developes characters and drama from their day to day interaction, gets bogged down in the soap opera minutia for awhile, and then skims off the characters he finds fun and wants to keep, moves them to a new lighter setting and begins the cycle again. He has shown some awareness of this in the current strip with teh “drama tag” storyline. See David, somebody’s paying attention! This may have something to do with licking cane toads. No this isn’t something that belongs on the Arlo! page. The skin of the cane toad is known to give off a slightly hallucinogenic substance. Because of this substance some people lick them to get high. Robin may be licking the toys in hopes of some sort of permanent high that would be brought about by the brain damage she seems to be trying to inflict on herself. Lead paint is, I think, sweet. Couple that with the cane toad/robin’s an idiot thing, and you have a comic. What? You don’t remember those sweet lead pellet cake decorations?